*just as collaboration changes the nature of any project, so does information technology change the nature of collaboration--its speed, character, methods, and possible implementations. The first to explore new and important ways for humanities scholars to collaborate across disciplines via electronic media, this book redefines electronic collaboration; presents insightful models of student collaboration; provides important models of faculty collaboration with special emphasis on professional development; and offers a look at the future of electronic collaboration and the overall future of the humanities. Featuring the voices of humanities teacher-scholars at all stages of their professional careers, the chapters emphasize pedagogy, outlining contemporary issues and options. Electronic Collaboration in the Humanities speaks directly to anyone involved with interdisciplinary initiatives in colleges and universities, such as writing across the curriculum and communication across the curriculum programs, and to specific populations within the humanities, including literacy and technology, language and literature, literacy studies, professional writing, and English education. Contents: M. Vielstimmig, A Word to the Fore. J.A. 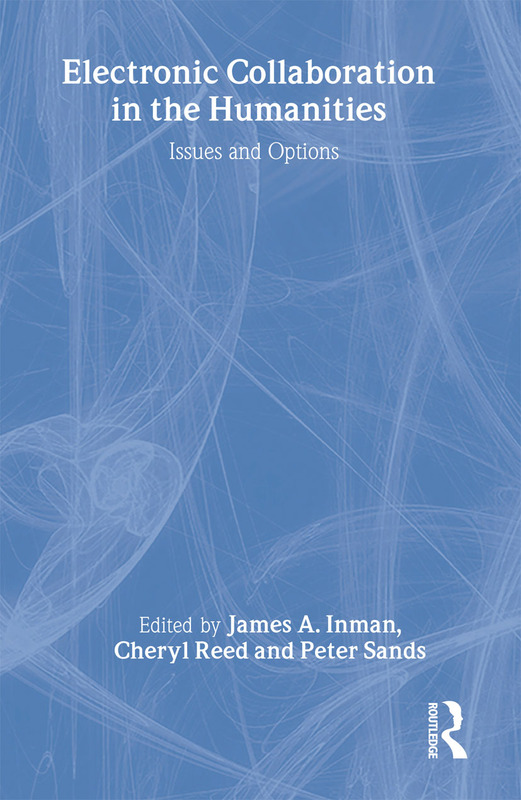 Inman, C. Reed, P. Sands, Preface: Issues and Options for Electronic Collaboration in the Humanities: A Framework. Part I:Theories of Electronic Collaboration. S. Turkle, Collaborative Selves, Collaborative Worlds: Identity in the Information Age. J. Carlacio, What's So Democratic About CMC? The Rhetoric of Techno-Literacy in the New Millennium. R.J. Rickley, Computer-Mediated Communication as Reflective Rhetoric-in-Action: Dialogic Interaction, Technology, and Cross-Curricular Thinking. J.A. Inman, Electracy for the Ages: Collaboration With the Past and Future. R. Gajjala, A. Mamidipudi, Collaborating Across Contexts: Rethinking the Local and the Global, Theory and Practice. S. Tchudi, Response. Part II:Student Collaboration and Electronic Media. N. Knowles, M.W. Hennequin, New Technology, Newer Teachers: Computer Resources and Collaboration in Literature and Composition. M.E. Fakler, J.E. Perisse, Voices Merged in Collaborated Conversation: The Peer Critiquing Computer Project. A.L. Trupe, Reentry Women Students' Online Collaboration Patterns: Synchronous Conferencing in a Basic Writing Class. J.B. Paoletti, M.C. Sies, V. Jenkins, Using a Virtual Museum for Collaborative Teaching, Research, and Service. D.S. Corrigan, S.M. Gers, Across the Cyber Divide: Connecting Freshman Composition Students to the 21st Century. C.L. Prell, Web Writing and Service Learning: A Call for Training as a Final Deliverable. B. Freidheim, Response. Part III:Faculty Collaboration and Electronic Media. C. Reed, D.M. Formo, Writers Anomalous: Wiring Faculty Research. D.N. Sewell, What's in a Name? Defining Electronic Community. K. McComas, Cow Tale: A Story of Transformation in Two MOO Communities. C. Szylowicz, J. Kibbee, The Collaboration That Created the Kolb-Proust Archive: Humanities Scholarship, Computing, and the Library. T.L. Benson, Response. Part IV:Electronic Collaboration and the Future. T.A. Jackson, Imagining Future(s): Toward a Critical Pedagogy for Emerging Technologies. P.J. Morris, II, Critical and Dynamic Literacy in the Computer Classroom: Bridging the Gap Between School Literacy and Workplace Literacy. T. Fanderclai, Collaborative Research, Collaborative Thinking: Lessons From the Linux Community. P. Sands, Current and Future Research in the Production and Analysis of Electronic Text in the Humanities: Bridging Our Own "Two Cultures" With Integrated, Empirical Studies. J.C. Freeman, Imaging Florida: A Model Interdisciplinary Collaboration by the Florida Research Ensemble. R. Bass, Response. A.R. Gere, Afterword.